Teatronica is a step in a new direction for Irish record label, Diatribe. Up to this point their entire catalogue has been dubbed ‘experimental’ or at the very least, for niche audiences. 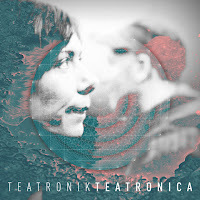 The release prior to Teatronica was Thought-Tronix: My Guess Remixed, which featured electro-acoustic jazz – you can understand the surprise when the press notes for TeaTroniK read ‘electronic pop’. This record is a much more straightforward piece with the mainstream in focus. What you end up with is a simple sound - it’s quaint, tidy and settled. For better or worse, there aren’t many surprises. You could play Teatronica at a hipster cafe and none of the customers would be disturbed. Simplicity is the name of the game. The percussive sounds are bright and wispy, the synths and pads usually playing major chords. There are ambient moments and even a few drum breaks. Piano keys are layered in here too. Vocalist, Monika Harkin is Teatronica’s lifeblood, with all of the instruments playing second fiddle. The mix is pleasant without a matter of urgency. Harkin’s performance is definitely up to it - hanging in there with Portishead’s Beth Gibbons and even reminiscent of Liz Fraser (Cocteau Twins). She’s mostly wistful, but only because this kind of laid back electronica requires her to be. When things crank up on a chorus, she can really belt it out. All in all, this is an interesting diversion for Diatribe Records. One that though not earth-shattering, is certainly accomplished. Importantly, TeaTronik plugs a gaping hole in the labels discography – the pop genre. Some may be put off by Teatronica's soft edges, but its change in direction is another string to Diatribe’s bow. This accomplished attempt at mainstream electronica proves the labels dynamism - the ability to work successfully in both experimental and popular genres. A State of Emergency is declared. The weather hazardous, as Kiev is ‘paralysed by heavy snowfall’. Just our luck we thought, when we realised we’d be boarding to the Ukrainian capital two days later. This was supposed to be a holiday trip, organised by our Journalism department, during the week we had free for the Easter break. Before leaving I was already thinking about getting back to Finland. Kiev was in chaos. Getting around the city was difficult. The footpaths were littered in snow, with thick layers of ice underneath. It was deceptive when we thought a pathway was clear of snow – we’d slip as our feet touched the glassy substance on the ground. The falling debris of ice from the rooftops kept us on our toes. The military presence was escalated. Soldiers helped to scoop the snow from the busiest roads and the police were doing their best to orchestrate traffic. It was bitterly cold too. Our plans to keep a zest of focus about the trip, rather than engaging in the hedonism of student life (Ukraine’s food and drink is considerably cheap) included making stops by the Mohyla School of Journalism, and Kyiv Post, an independent English speaking newspaper in Kiev. “We have to teach our students about freedom of expression, how best to express it, and not to be scared,” says Yevhen Fedchenko Ph.D, director of the Mohyla School of Journalism, part of the National University of Kyiv. Liberties in expression are deemed a ‘recurring problem’ in Ukraine, and perhaps it’s easy to see why - the aftermath of the Soviet Union. The countries in the Soviet block had their media output completely controlled by the Kremlin, with censors on the lookout for anything that might be harmful to the Communist regime. The censored media culture of the past has left its mark. There is still a remarkable impact felt today. “Bribery’s still a big deal. Institutions, politicians and wealthy individuals can offer you more than what you’re getting from your employer, for spin on a story”, continues Fedchenko. “Practicing journalism in the right ethical manner is not something we want students to consciously think about – we try and teach them guidelines to follow”. We also visited Kyiv Post, the leading English speaking newspaper in Ukraine. Owned by a wealthy British citizen, Mohammed Zahoor, Kyiv Post targets the foreign and expatriate market in the city. Crucially, in Ukraine, it’s an independent publication. We met Kyiv Post’s editor in chief Brian Bonner, an American, who decided to come to Ukraine, because in his own words “it’s an interesting place”. Kyiv Post has had their controversies. In April 15, 2011, Bonner decided to publish an interview with a government official, despite the owner’s request to drop the article. Bonner was fired, which sparked a strike. Five days later, Bonner got his job back, and the strike ended. He laughed, “Thankfully the whole thing blew over pretty quickly”. What the strike would highlight was the status quo of independent journalism and freedom of expression in Ukraine. “Journalists have had their lives threatened here – it’s definitely not a profession for the faint of hearted”, he reflected. “You know, parliament tried to push a bill on criminalising defamation not so long ago”. This means that if you spread deliberately untrustworthy information which undermined a person, institution or business, a potential prison sentence of up to five years could be served, by anyone - not only media personnel. “Yep, it’s a little crazy… thankfully, the bill didn’t go through” said Bonner, in mid chuckle. “We’d be going back to the dark ages”. Indeed, these are reflections of times under the Iron Curtain, and Russia-Ukraine relations are notoriously complicated – a hot topic for the locals. Recently, Russia reacted aggressively when Ukraine looked to join NATO in 2008, a proposal that was shelved in 2010 by current President Yanukovych. Russia’s influence is obviously strongly felt with Ukraine on her borders. But the controversies go far deeper. Accusations of genocide against Ukraine are still contested by both Russian and Ukrainian governments. The “Holodomor” incident, which happened between 1932 and 1933 is largely considered by many to be a man-made famine, created by the USSR – 2.5 to 3.5 million Ukrainian’s lost their lives. The cause of the famine is still debated, with some saying it was due to a lack of resources in the USSR’s transition to industrialisation. Others say it was a deliberate attack on Ukrainian nationalism. As we ventured around the capital, it became easy to understand Bonner’s positivity. The signs of modernisation are clear. Kiev’s airports and public transport system can rival facilities made in the West – no doubt due to recently hosting UEFA’s 2012 European Championship. Then there’s Kiev’s architecture, which at times is breathtaking. It’s often a mash between eastern, Soviet architecture and glass furbished western sky scrappers. In the face of transition, it was clear that Kiev had terrific character and identity. Yes, change may be on-going, but Kiev would always remain herself. But, where does that leave expression? The answer is unclear. The optimist might think that with the progress already made by the country, expression will find its way too. The pessimist might think the damage has already been done. Before saying his goodbyes, Bonner reflected, “In twenty years, I guarantee, there’ll be even more developments… politically, industrially, economically. Who knows how far the country will have come by then? It’s already came a long, long way”.